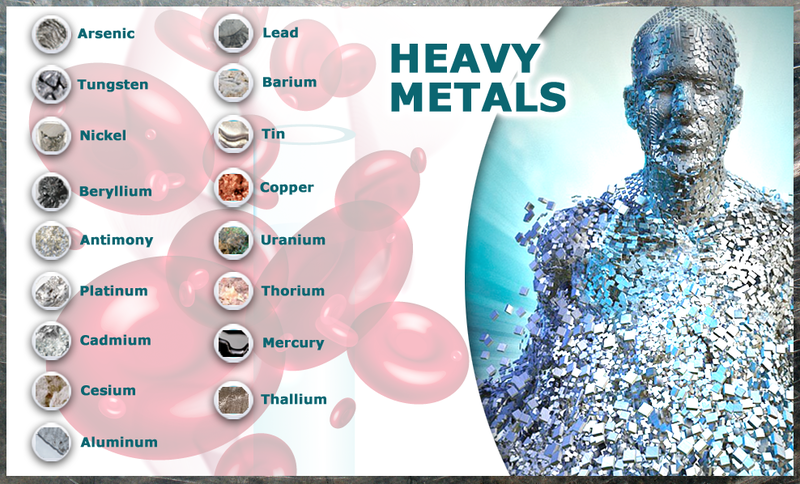 Heavy metals and metalloids happen in the earth’s crust naturally. They become environmental contaminants through activities such as mining, smelting, coal-burning as well as other agricultural, industrial, and domestic production. Besides, natural phenomena, such as weathering and volcanic eruptions, also lead to heavy metal pollution. A study published in 2003 in the British Medical Bulletin reported that all heavy metals, exposure to mercury, lead, arsenic and cadmium, are especially harmful to human health. 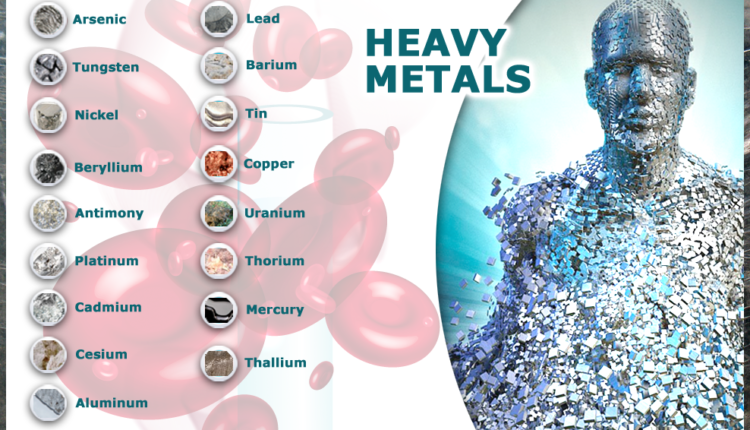 Heavy metals enter the bodies in three ways including inhalation, ingestion, and absorption. Long-term exposure to cadmium and chromium can cause lung cancer. Long-term exposure to lead can cause palsy, anemia, and kidney disorders. Long-term exposure to arsenic can cause diabetes, hyperpigmentation, and skin cancer. Long-term exposure to mercury can cause stomatitis, tremor, and neurotic disorders. Detoxifying heavy metal is important to living a long life and preserving the health. 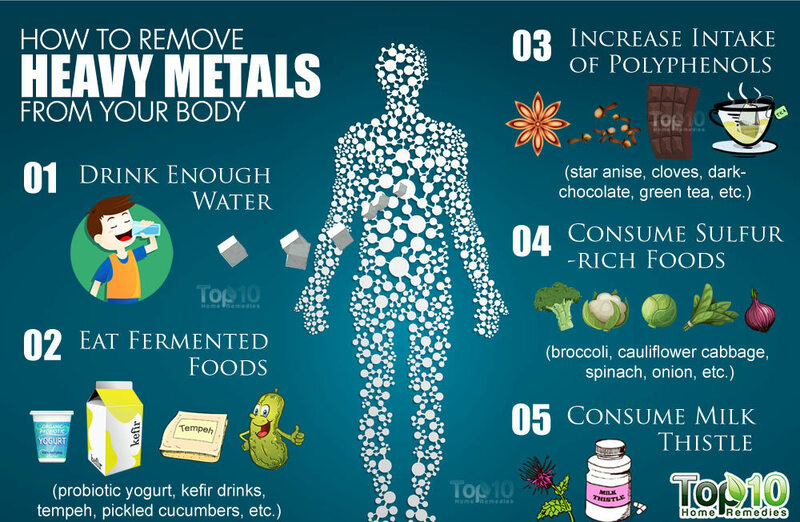 Let me show a few natural home remedies and tips to take heavy metals out of the body. Glutathione is a key to remove harmful toxins as well as heavy metals from the body. It flushes them out through the bloodstream via the kidneys and liver. Arsenic is a heavy metal directly preventing the glutathione production in the body. The glutathione activity in the body will be boosted by sulfur-rich foods. Thus, to aid in removing heavy metals from the boy, it is suggested to consume foods rich in sulfur, such as cruciferous vegetables like kale, broccoli, spinach, collard, cabbage, watercress, cauliflower and Brussels sprouts, as well as onions, garlic, leeks and shallots. Consuming oral glutathione supplements also helps you a lot. Remember to consult your doctor before using them. A deficiency of water is prone to have adverse consequences because the body is made up of 65 % water. Dehydration is the main cause of oxidative stress, which prevents the ability of the body to combat cell-damaging free radicals. Oxidative stress will trigger their toxicity when heavy metals enter the bodies. Drinking enough water lowers oxidative stress and prevents the heavy metal toxicity in the body. In addition, water transports essential minerals and nutrients throughout the body. These minerals and nutrients enhance the detoxification organs such as the liver, intestines, kidneys, respiratory tract and skin. Milk thistle helps to strengthen the liver cells, which inhibits the absorption of toxic metals. Milk thistle contains an active substance named Silymarin or silybum marianum. Silymarin can treat heavy metal contamination, promote the glutathione production and prevent its depletion, according to a study published in 2006 in The Indian Journal of Medical Research. It is not difficult to combine milk thistle into your regular diet. For detoxification purposes, you can consume up to six cups of milk thistle tea per day. You can easily make the tea at home by adding a milk thistle tea bag or ground milk thistle seeds (1 teaspoon) to 1 cup of hot water. Then, leave it to steep for 10 minutes. Finally, consume it. Another option is to take milk thistle supplements. To inhibit possible side effects, you should consult a doctor for the tea and exact supplement doses appropriate for the status of your health prior to taking milk thistle in any form. The role of probiotics in ridding the body out of heavy metals isn’t widely known. And fermented foods are a rich source of probiotics. A study published in 2012 in Applied and Environmental Microbiology indicated that the intestine and fermented foods have probiotics like lactobacillus, which possess the ability to restrict heavy metals and remove them from the body. Fermented foods containing the good bacteria include whey, probiotic yogurt, cottage kefir drinks, cheese, fermented tofu and tempeh, and pickled cucumbers, beets, radishes, and garlic. It is advised to make them become a part of your daily diet to promote the beneficial bacteria growth to rid the body of heavy metals. Cilantro possesses terrific antioxidant properties, which help to get rid of heavy metals from the body. To aid the detoxification effort, you should consume a cilantro smoothie for breakfast each morning. To make this smoothie, you need to juice together a bunch of cilantro, a zucchini, 1 green apple, 1 long celery stick, the juice of half a lemon together with a handful of sea salt for around 30 to 60 seconds. To achieve the consistency as desired, you can add some water to it. Finally, enjoy it. Generally speaking, polyphenols are micronutrients found richly in our diets. They are well known for their ability to combat cancer and cardiovascular disease as well. Some foods, which contain the highest sources of polyphenols, consist of cloves, dried peppermint, star anise, dried oregano, cocoa powder, flaxseeds, dark chocolate, elderberries, green tea, chokeberries, strawberries, blueberries, black currants, and plums. Dietary polyphenols also help to boost the metallothionein production, a major antioxidant enzyme. The enzyme helps to metabolize and detoxifies heavy metals as well. A study published in 2010 in the Journal of Food Science stated that polyphenol-rich beverages such as red grape juice, red wine. and green tea increased the production of metallothionein in the human body. Thus, consuming more polyphenol-rich foods help to detoxify the body of heavy metals. One of the most effective remedies of purging the body of heavy metals via thermogenesis and sweat is sauna bathing. Longer sauna sessions are needed to mobilize and take heavy metals out of the body. Basically, these sessions must be monitored medically, but are general a safe way to remove toxins from the body. Prior to going for a sauna, the elderly as well as those with health problems must consult a doctor because the thermogenic effect might cause negative health effects like an increased heart rate. Especially, saunas are useful for excreting lead and mercury from the body. The antioxidant allicin in garlic is formed from alliinase and alliin when its cloves are crushed. While cleansing the liver, garlic helps to reduce blood pressure and cholesterol. Garlic also has antiviral, antimicrobial, antibacterial, and antifungal properties, which help to rid the body of heavy metals. It offers unique health benefits as consumed in raw versus aged or cooked. Onion comes with the antioxidant quercetin and relieves congestion and allergy symptoms. It also helps to reduce cholesterol. Besides, it can prevent and treat cataracts, coronary heart disease, and atherosclerosis. It also helps to take heavy metals out of the body. Burdock root is a potent blood purifier, which flushes out heavy metals like mercury and other toxins. Burdock is also used to cure skin conditions like acne because it contains up to 45% inulin, arctiopicrin, tannins, arctiin, and volatile oil. In addition, it aids in purifying the liver and is utilized as a natural treatment of cancer. Remember that detoxifying heavy metal is a long process. Exposure to heavy metals is unavoidable while following the methods in my article will help the detoxification process significantly. You will need to take steps to limit your exposure to the heavy metals while you follow the above-mentioned methods for maximum benefit. What are the common Causes of Bleeding Gum?